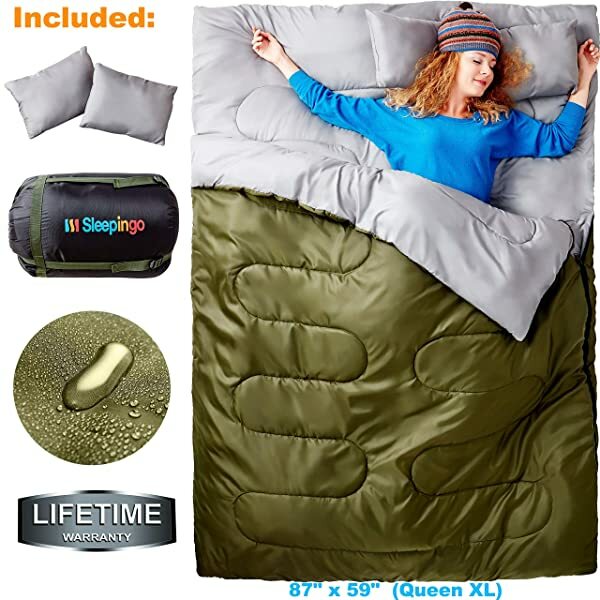 The best double sleeping bags will make camping seem like a hotel room stay with ultra warm and comfortable queen-sized beds. But a quick search will net you a dizzying amount of options, and it can become overwhelming. So how do you pick the right one? There’s nothing more romantic than camping out under the stars with your significant other. Imagine breathtaking views, peaceful scenery, and fresh air – all while cuddling over some hot chocolate (or maybe a bottle of wine, if you’re feeling fancy!). Sounds like the perfect date, right? And to really take that romance to the next level, nothing is more essential than bringing the best double sleeping bag around. Instead of using two separate sleeping bags like you did back when you were single, why not just tuck into a bigger one? Aside from the obvious advantage of all-night cuddling, the combined body heat will keep both of you pretty warm and toasty. They’re also roomier than single sleeping bags, allowing you to find that perfect sleeping position. Plus, it’s one less thing to bring along – which can really ease up your packing. 1 How to Choose the Best Double Sleeping Bag? How to Choose the Best Double Sleeping Bag? Probably one of the most important things to consider is how warm you and your partner will be while sleeping in the bag. You wouldn’t want to freeze your butts off when you wake up, but you don’t want to be a sweaty mess, either. That’s where the Temperature Rating comes in. This tells you the lowest temperature you can go while still staying warm and fuzzy. So a temperature rating of 32 F, for example, means you’ll stay pretty warm even if outside temperatures reach 32 F.
The best double sleeping bag for you will ultimately be based on when you plan to use it, so buy accordingly. While it’s nice to get the biggest double sleeping bag, you also need to take into account how heavy and bulky it is. You want the comfort of a queen-sized bed, but not the hassle of packing and hauling it around! The best double sleeping bags in the market are designed for portability. Many feature a compression bag so you can fit the entire thing into a surprisingly compact carrying case the size of a gym bag. Again, think of how and where you’ll be using it. If you plan on doing a lot of backpacking or heavy hiking, a lighter and more compact sleeping bag would obviously be an important consideration. A good thing to look out for is how the inner lining feels on your skin. Polyester is a standard material and does the trick for the majority of people. Others prefer cotton, which can be softer and more comfortable but might not be as cold resistant since it traps moisture. The outer material, or shell, is also one thing you should look into. A good shell should protect you from the outside elements like dirt and moisture. In particular, you’d want it to be waterproof at the very least – unless you enjoy waking up damp and moist! Ripstop is a popular material because it is highly durable, while Dryloft is also a good option because it’s waterproof yet breathable. While double sleeping bags are by nature quite wide and roomy, some are more spacious than others. Most offer the bare minimum and fits two people just right, but some provide a massive space that can house a small family. Again, look at where and whom you’ll use it with. Getting an XXXXL double sleeping bag is a bit of an overkill if it’s just the two you – unless you really like the space! If in doubt, shop with your significant other and try out the sleeping bags before buying. It makes for excellent pre-trip shopping and really hypes you up for the big day! Beyond the essentials are the nice extras that bring a little more pizzazz into the sleeping bag experience, like little pouches inside the bag for placing small items like phones or accessories. Two-sided zippers are also good to have, allowing you to open only your side of the bed so as not to disturb your partner. Some have a detachable hood that wraps you up from head to foot for maximum warmth. Again, see which of these features fit your preferences, needs, and budget. If you’re still having a hard time deciding which one to get, let’s make your life a little bit easier with our top recommendations for the best double sleeping bags. That way, you can choose faster so you’ll get camping and cuddling in no time! The Sleepingo Double Sleeping Bag is one of those rare combinations of fantastic price and great value. At 87″ x 59″, it’s slightly bigger than a queen sized bed. At first glance, it didn’t look particularly spacious. But when we tried it out, boy, were we wrong! This can comfortably fit 2 adults with lots of room to spare. We’d imagine even a 6-foot person would have no trouble fitting in this one. The inner lining is made of a combination of cotton and tetron, and was also surprisingly comfortable, given that I had some hesitations when I tried it out at first (remind me never to judge a sleeping bag again by its looks!). With a temperature rating of up to 32 F, it kept us pretty warm even on a chilly fall night. The outer shell is made of sturdy polyester, which proved effective at keeping us nice and dry. It’s also surprisingly light and easy to carry, thanks to its compression bag which drastically reduces it to a portable 15” x 12”, 6 lb frame. Admittedly, it’s not the easiest thing to pack in the beginning, but there’s an art to it. Plenty of practice, combined with tons of videos online, should get you there in no time! The pillows are a nice bonus, but honestly, you won’t miss them. They’re a bit small and flat for most people, and you’re better of bringing your own. 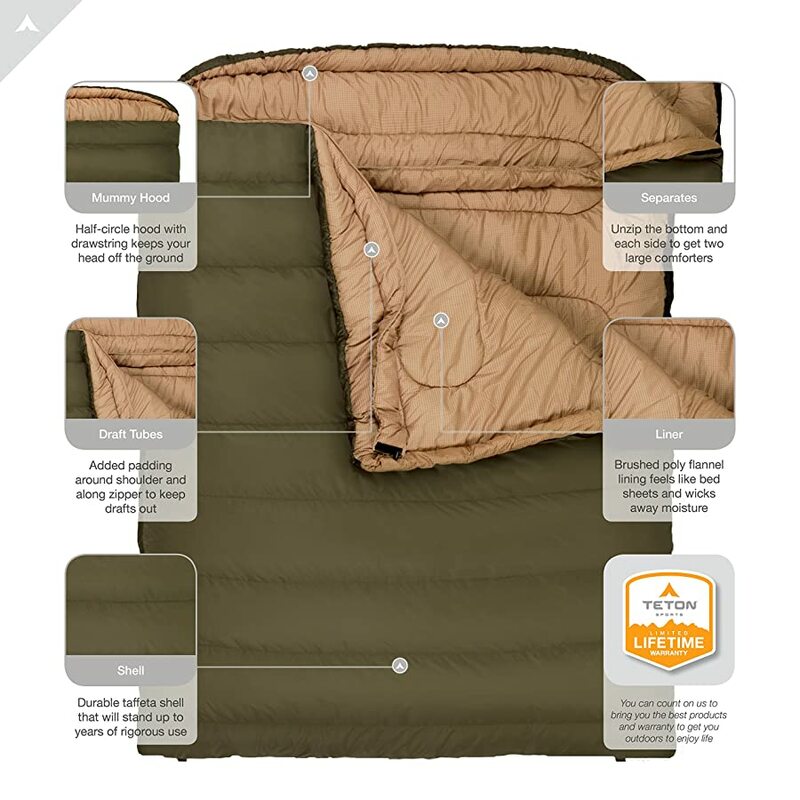 Overall, this is a serious contender for the best double sleeping bag; excellent temperature rating, generous space and great portability at an affordable price. The Gideon Extreme Waterproof Double Sleeping Bag is one of the most affordable double sleeping bags you can find in the market, but don’t let the price fool you! This 59” x 87” bed still delivers a roomy and comfortable sleeping experience. As the name suggests, the Gideon is highly water resistant from your usual camping woes like condensation, humidity, and sweat. It even withstood the morning dew and kept you completely dry when you woke up the next morning. The lining also had us fooled a bit – it looked fragile, and we had our doubts if this thing can keep us warm. But thankfully, it delivered! We managed to stay relatively warm thanks to its 50F rating. Perfect for summer and fall camping trips, but might not be enough for winter. It can compress down to an 18″ x 12″ x 12″ bag at 5.7 lbs, which makes for easy carrying and storage. It’s a lovely sleeping bag to have for a quick car camping trip, but it might be a little bit too large for serious backpackers. All in all, this is one of the best double sleeping bags that deliver all the essentials (plus more!) at a ridiculously affordable price tag. 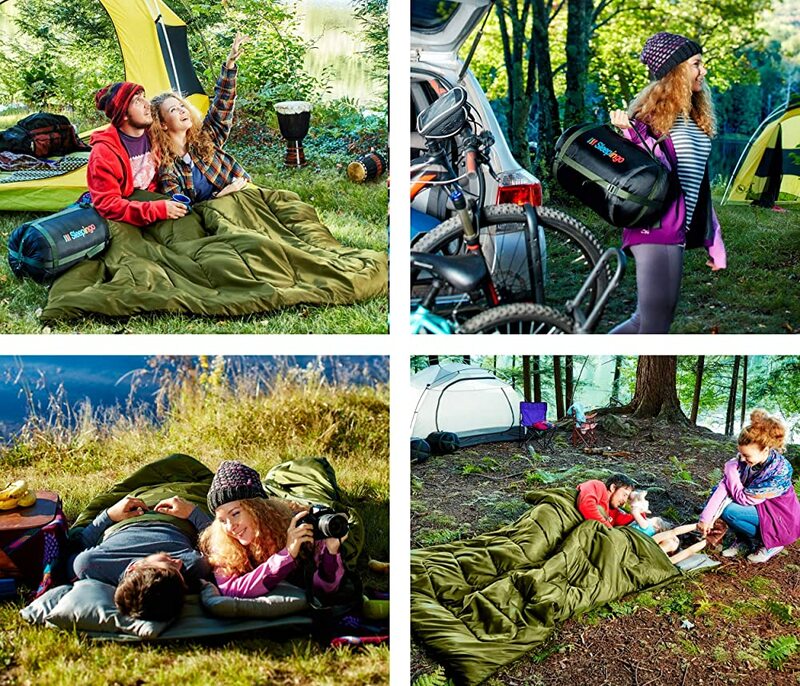 If you like to camp out in style, then the Chillibo Double Sleeping Bag’s awesome designs will certainly not disappoint! Whether you choose the colorful and psychedelic Rainbow Design or the cool and calm Blue Leaf, it’s sure to fit any mood or personality! Despite looking quite cute, the Chillingo still delivers a warm and comfortable feeling. The thick 210 thread count polyester shell protects you from outside dirt and moisture, while the inner PP cotton lining is quite cozy and comfortable, just like Egyptian cotton! It’s also well-made and durable, but keep in mind that this is not at all suitable for rugged, extreme use. It’s best used for backyard camping or light hiking. Because of this, it’s the best double sleeping bag for kids, as they will surely love the colorful and stylish designs. We’d like to say it right off the bat – the Teton Sports Mammoth Double Sleeping Bag is one of the best heavy-duty double sleeping bags out there, bar none! This thing can keep you warm even in icy, 0F weather. You can tell at first glance that this sleeping bag means business. Its noticeably thick lining is made of SuperLoft Hollow Fiber that traps air for maximum warmth. It made us nice and toasty even in 40F weather – wearing nothing but shirts and shorts! It’s also VERY roomy and way more substantial than a queen-sized bed. A family of three would fit very, very comfortably in the Teton Sports Mammoth. As you would expect, however, all that warmth and cold-stopping power make it a bit bulkier and more substantial than your typical sleeping bag. The included compression bag can reduce it down to 28” x 15.75” x 15.75” at 16.5 lbs, but it’s still substantially bulky. 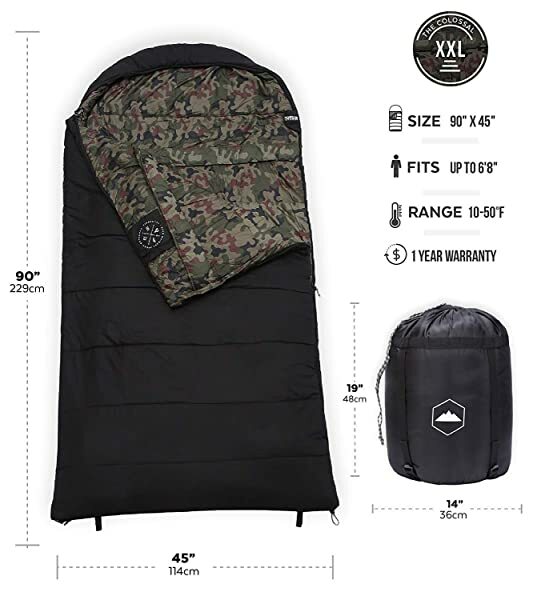 One of the most massive double sleeping bags out there is the Colossal Winter XXXL Double Sleeping Bag. When they say it’s colossal, they mean it! The huge 95” x 66” dimensions are similar to a king sized bed, and can fit 2 people up to 7 feet tall with plenty of room to boot. Perfect if you or your significant other is tall yet wants a great time sleeping outdoors. It’s thick and well manufactured, with a very soft lining capable of keeping you warm even in chilling 10F temperatures. One try, and you would see how comfortable and cozy this sleeping bag is. 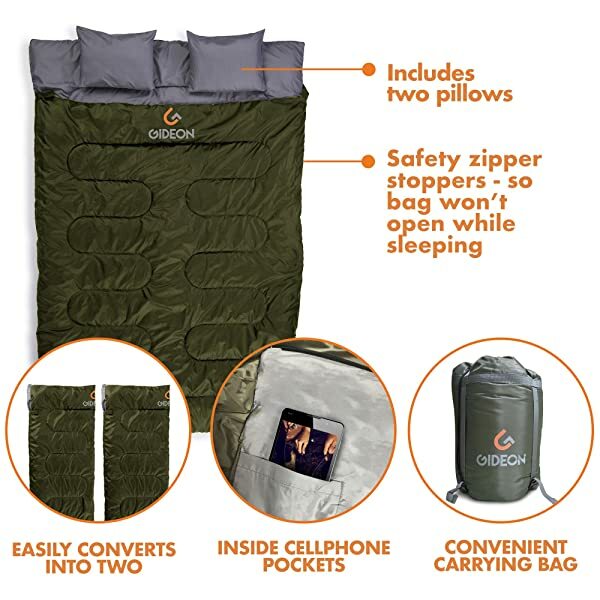 Maybe it’s the spacious interior or the lining that’s the culprit, but overall, you would be guilty of oversleeping in this double sleeping bag. It’s such a joy to sleep in. Rolling up and compressing a double sleeping bag back into its bag is a common complaint with most, but not this one. The Colossal, despite its vast size, is a breeze to return to its compression bag. The only downside is that the zipper is only on one side, so it’s hard to get out without disturbing your partner if he/she is sleeping. Overall, this is a solid, well-made, HUGE and comfortable choice that’s well worth the price. It’s certainly one of the best double sleeping bags, especially in terms of space! The Winner Outfitters Double Sleeping Bag is another “winner” (no pun intended!) in the “best double sleeping bag for value” category. The lining is made up of a mix of tetron and cotton and is quite comfortable. It feels like a soft and cozy blanket more than anything. The great thing about this sleeping bag is the mummy hood. If you’re feeling a bit colder than usual, just slip it on for total warmth from head to foot! It’s also detachable if you don’t have any need for it. Despite being rated at 32F, we find that this is more of a summer or late spring sleeping bag more suited to warmer weathers. While tolerance is subjective, we do recommend you to bring along some extra layering if you plan to use this in colder months, just to be safe. This can be a downside if you’re looking for a fall/winter bag but shouldn’t be a problem for you summer campers out there. Zippers can also snag occasionally, and it can be difficult to return to the bag, but these are not really that big of a deal. 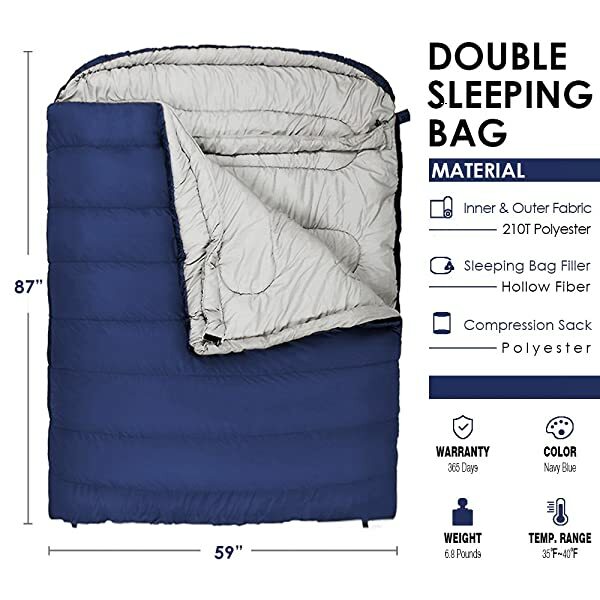 Overall, this is an excellent purchase especially at the price range it is in, especially if you often go camping in warmer weather. 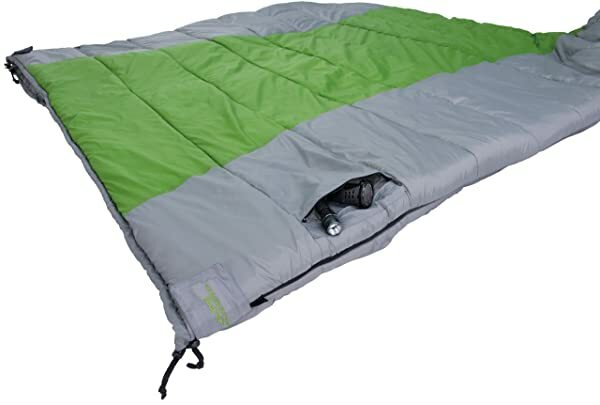 When we first laid our eyes on the Omnicore Double Sleeping Bag, we knew it was going to do an outstanding job. Call it love at first sight if you will, but the sleeping bag looked the part of one very serious camping gear. 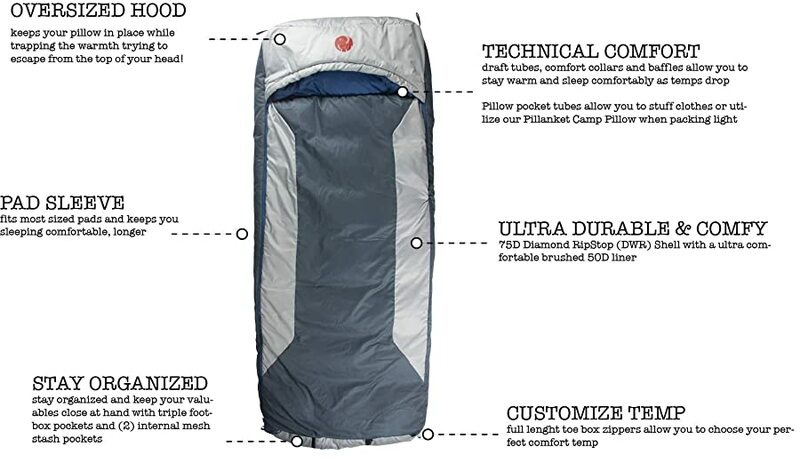 While other sleeping bags look like oversized blankets, this one looks like a compressed tent. Taking some design cues from mummy type sleeping bags, the rectangular shape allowed a lot of room while keeping the inside warm at the same time, even at freezing 0F temperatures. Its cold stopping power is thanks to its insulation filling that combines natural duck down with manmade StratusLoft fill, which is extremely effective at trapping heat and moisture. The included mummy hood prevents heat from escaping through your head for added warmth, and it doesn’t even feel suffocating at all. It’s also very lightweight for its performance and is a dream to sleep in. In short, this is a very great buy and one of the best double sleeping bags you can get! You won’t regret getting this one. While it just looks like a simple, flat comforter at first, the ALPS Mountaineering Double Sleeping Bag feels like a real sleeping bag the moment you snuggle inside. It features a two-layer construction with Tech Loft+ insulation, which allowed us to stay pretty warm even in mid 30F temperatures. We’d imagine this working pretty well even at freezing weather. It zips up all the way, too, which is effective at preventing any cold air from rushing in, especially if you move a lot while you sleep. The inside lining is soft and decently comfortable and doesn’t feel annoying or sticky. If you like added comfort, it could easily fit a queen-sized mattress on all sides. Quality is superb, and nothing feels shoddy or poorly constructed. The only drawback I see is that the sleeping bag is not as breathable as I hoped it would be. That’s OK for cold weather, but not so great for warmer days. As such, this bag really shines in light winter temps and not for summer or late spring. Q: I still feel cold in my sleeping bag, even if it’s rated at 0F! Is there any way to keep me warmer? A: The key to keeping warm is heating the air inside of the sleeping bag and keeping it there. 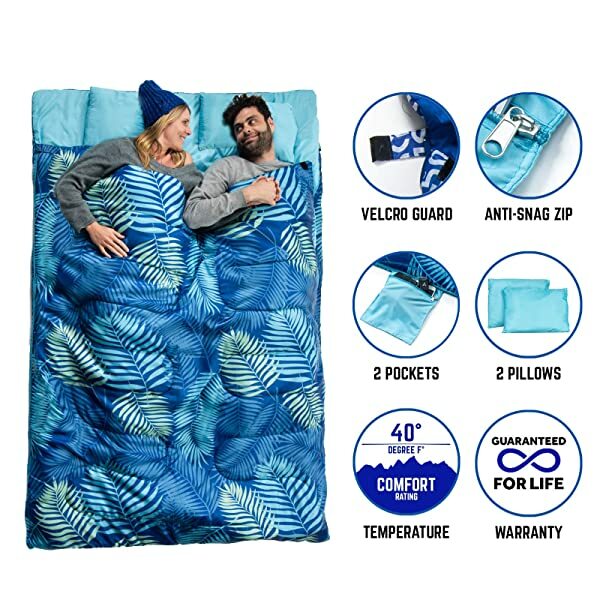 Double sleeping bags already have an advantage in this department, since the combined body heat of you and your partner should be more than enough. Plus, any sleeping bag worth its salt should be able to retain heat. If you’re still feeling cold, try warming your body before getting inside the bag. A few push-ups, jumping jacks, or jogs in place would do the trick. You would also do well to place a pad underneath the sleeping bag to act as a barrier against the cold ground. It might seem counter-intuitive, but it might help to lose a few layers of clothes. You’d want your body heat to warm the air, not your clothing. Q: How long can I use my double sleeping bag? A: This is a highly subjective question, as it depends on the quality of the bag and how you use it. As a rule of thumb, though, your ordinary synthetic sleeping bags should be usable for around 4-5 years of weekly use before they start to lose some of their warming power. Down sleeping bags, on the other hand, are longer lasting, keeping you warm for a good 15 years with weekly use. Of course, proper use and regular cleaning are crucial. Q: How do I clean my double sleeping bag? A: First, it goes a long way to buy a sleeping bag that is machine washable. Cleaning a huge double sleeping bag by hand is not the most pleasant of chores! With that said, even a machine washable sleeping bag is not as simple as throwing it in the washing machine and calling it a day. Top-loaded machines might damage the sleeping bag, so a front-loaded one is best. Use a gentle cycle and cold water, and don’t forget to do an additional rinse and spin cycle to make sure you get all water and soap off. Camping trips are a fantastic way to spend a little romantic time with your significant other, and nothing connects you two better than some cuddling and stargazing in your comfortable double sleeping bags! Get one today and start planning your next camping date!